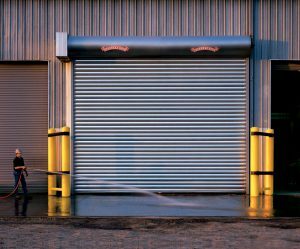 The breadth of Overhead Door Company of Houston’s rolling service door product line ensures that your project specifications will be met with ease and style. Ideal for situations where sideroom and headroom are at a premium, our upward-coiling service doors fit openings up to 1500 sq. ft. (139,355 sq.mm) and are available with the industry’s widest array of slat profiles, curtain materials and colors, offering a virtually endless array of options to satisfy both aesthetic considerations and working requirements. -Fenestrations are available on the 620 (with vision lites) and the 625 (double glazed insulated or single glazed non-insulated).